Who can ever forget Walter M. Gaines! No, wait a minute. That doesn't sound right. Oh sorry. Its "William M. Gaines"! And yes, who could ever forget him? I can't. And trust me, I've tried! Anyway, since he haunts my apartment and my boat, I appease him by keeping this tiny little (cheap!) piece of the web going in his memory. If you're here Bill, move the bars on the equalizer! A genius who is sorely missed. He was a one of a kind man, and a kind man too. Bill is no longer on this planet, but hopefully he's somewhere wonderful, with a Nathan's frankfurter in one hand, and a glass of great wine in the other. Whenever we used Gaines as a name in a MAD magazine satire, we added something make his name more "grand". The last name I remember for Bill was: William Mildred Farnsworth Higgenbottom Gaines, Pious the IX! Like many of us, Gaines loved gadgets and gizmos. I had a great deal with Gaines. He hated reading instruction books, so one day he said: "You love gadgets and I love gadgets. But I can't stand figuring out how to make them work. So, let's do this: Buy any gadget you like that you think I'll like too. I'll pay for it. You play with it until you'll bored. Then give it to me and show me how to use it. That way I'll never have to look at the instructions!" Pretty neat, deal, eh? "We must never stop reminding the reader what little value they get for their money!" ....but the truth was that Gaines regarded the reader highly. He would personally read all the incoming mail. He refund money if anyone bought a piece of MAD merchandise which they felt performed poorly. If he got more than three complaints about a piece of MAD merchandise he would cancel the contract with the manufacturer. When he was at the helm Bill wouldn't let MAD be associated with any television show because he wanted control over who the sponsor might be. Of course not even Gaines could be given that kind of power, so he just passed on all TV offers. That was one of the few things we disagreed on, because I thought it would be great fun for the MAD writers to work on a MAD TV show. When Bill passed on, The MAD Show licensed the name from TimeWarner, but wanted no one from MAD involved! Gaines and I become fast friends shortly after a MAD dinner where he mentioned "The Elephant Hotel". "Oh you mean 'Lucy'" I replied. Gaines had never met another person who knew about the Elephant Hotel and the next weekend he insisted we make a trip to Margate, New Jersey (right next to Atlantic City) to see it in person. Poor Lucy was falling apart, so Gaines said we have to find the Mayor and get a fund going to fix her up. We went on a search for the Mayor and found his house. Gaines gave him a check and told him what a find it was to have Lucy in town. He promised more help and spread the word. It was on that same trip that Gaines introduced me to fried Taylor Pork Roll on soft hamburger buns! Mmmm....now there's a treat! 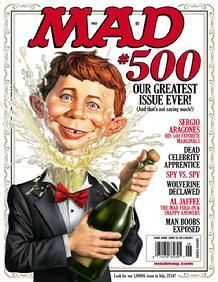 Hard to believe but MAD has passed it's 500th issue! Heck, we're closing in on issue 550! Click on the photo to hear the latest Giz Wiz Show with OMGChad and myself.